YourEDM.com — a website that focuses on covering news, releases, events and more that relates to electronic dance music. Andrew Quigley, the head Trance writer, reviewed Mirai EP. We here at Your EDM always pride ourselves in providing a platform for upcoming artists to grow and mature over time, and there isn’t an upcoming Psy Trance producer that we love more than the Israeli captain that is Daniel Lesden. His introspective works were discovered early on by the legendary Ovnimoon and since then, he has released a number of singles on esteemed labels such as Borderline Music, Perfecto Fluoro and Synergetic Records. We even covered his works before with a rare, detailed review of his debut album entitled Chronicles Of The Universe. The reason why we love him so much is because of the unique blend of styles that he effortlessly contributes to his ever expansive productions, as he fruitfully incorporates blisteringly edgy concepts with the essence and spirit of the older styles of Progressive Trance; a challenge that many artists attempt to nail, but never get right. We catch a glimpse of this notion in action with the release of his brand new single on J00F V.2 entitled Mirai, in which he teams up with fellow Psy Trance instrumentalist Spinney Lainey. The mixture of smooth, flowing flute and relentless, yet beautiful sounds of Daniel Lesden sends your senses on a wild ride throughout incredible new dimensions of sounds and colors. A very interesting aspect to this track is the fact that Daniel labeled Mirai as ‘Morning Psy Trance’, and while that particular sub-genre is not technically an established style, we can definitely see some aspects that demonstrate this innovative idea. Many of the wisps and gusts of sound wind that permeates the soundscape have a certain healthy aura to them and while they are within the biting sounds of Psy, they are not brooding, nor angry, nor saddened. Instead, they are vivacious and full of life, almost like they are ready to seize the day with an excited gleam in its eyes. Certainly, the beautiful melodies of Spinney Lainey only intensify this notion tenfold and the sheer improvisatory nature of her performance gives the track a more organic and life fulfilling context than if done with simply a computer. Additionally, the fact that the main bassline is moving within a joyous, even rapturous chord progression almost gives a sense of carefree livelihood that flows throughout the veins of Mirai. Of course, this isn’t to say that this piece isn’t intelligent in its own design, as the second drop is filled with a very fascinating selection of textures and hues that are systematically placed to challenge the listener in conventionality and abstractionism. Mirai is a beautiful Psy Trance work by Daniel and I’m also really happy to see Spinney Laney on a track again. Her melodious sound is rich and pure and adds a wonderful new element towards the entire genre. 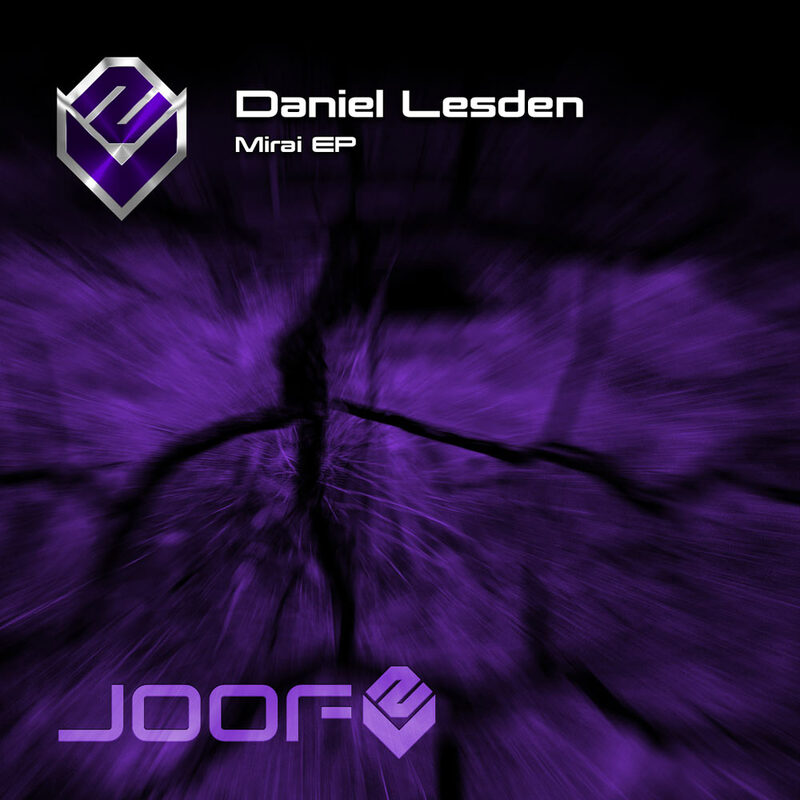 Daniel Lesden‘s fantastic single, Mirai, is now available on J00F V2 via Beatport, so make sure you purchase a copy and support real talent! Also make sure you check out the B-Side to this release entitled Out Of This World! GTranceFamily is the fastest growing independent network on this platform specialising in all things related to trance and it’s sub genre’s. 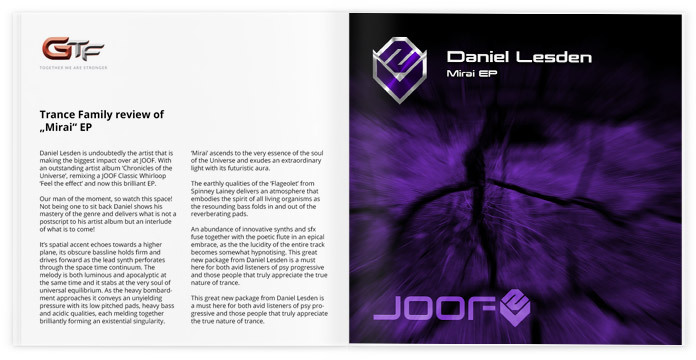 Head trance writer Simon Waring reviewed Daniel Lesden’s Mirai EP, forthcoming on JOOF Recordings. 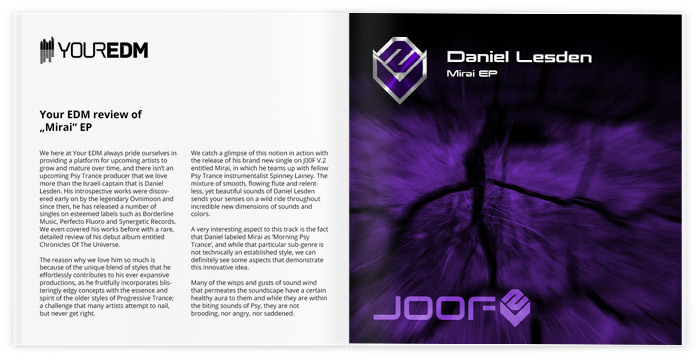 Daniel Lesden is undoubtedly the artist that is making the biggest impact over at JOOF. With an outstanding artist album ‘Chronicles of the Universe’, remixing a JOOF Classic Whirloop ‘Feel the effect’ and now this brilliant EP. Our man of the moment, so watch this space! Not being one to sit back Daniel shows his mastery of the genre and delivers what is not a postscript to his artist album but an interlude of what is to come! The first track on the EP is ‘Out Of This World’ in both name and production quality with his signature sounds dominating this track. It’s spatial accent echoes towards a higher plane, its obscure bassline holds firm and drives forward as the lead synth perforates through the space time continuum. The melody is both luminous and apocalyptic at the same time and it stabs at the very soul of universal equilibrium. As the heavy bombardment approaches it conveys an unyielding pressure with its low pitched pads, heavy bass and acidic qualities, each melding together brilliantly forming an existential singularity. The heavy matter gives way as it breaks the fundamental laws of physics and delivers another work of art that Daniel is becoming renowned for. This great new package from Daniel Lesden is a must here for both avid listeners of psy progressive and those people that truly appreciate the true nature of trance. ‘Mirai’ ascends to the very essence of the soul of the Universe and exudes an extraordinary light with its futuristic aura. The earthly qualities of the ‘Flageolet’ from Spinney Lainey delivers an atmosphere that embodies the spirit of all living organisms as the resounding bass folds in and out of the reverberating pads. An abundance of innovative synths and sfx fuse together with the poetic flute in an epical embrace, as the the lucidity of the entire track becomes somewhat hypnotising. This great new package from Daniel Lesden is a must here for both avid listeners of psy progressive and those people that truly appreciate the true nature of trance. While my album get supported by DJs such as John 00 Fleming, Airwave, Seven Ways, Dan Ascherl, and more, I’m pleased to announce that I working on a new EP. Two tracks, both not finished yet, but sounds nice so far. Besides that, another good news is that one of these tracks is a collaboration with a talented flautist Spinney Lainey! Check her SoundCloud page, her flute is gorgeous! Looking forward to share it with you guys, stay tuned.